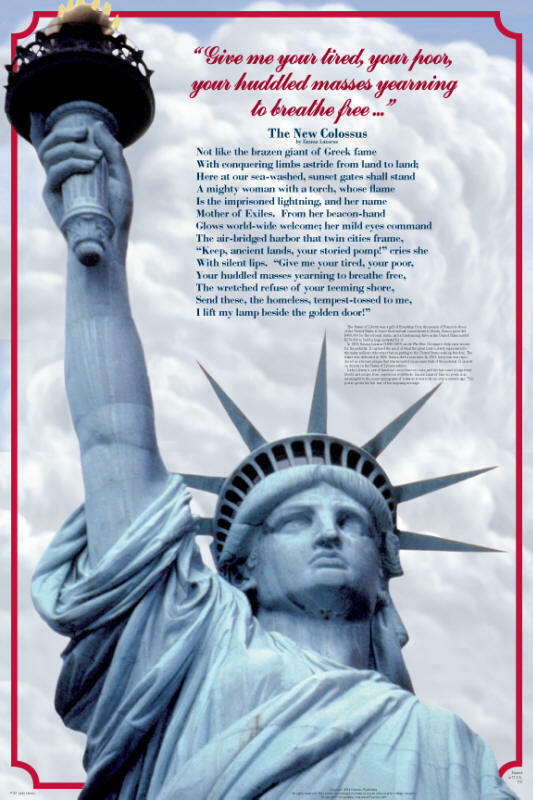 This poster shows America’s most famous lady accompanied by the full text of the poem The New Colossus, by Emma Lazarus (1849-1887). She wrote it in 1883 to help raise money for the Statue of Liberty pedestal. It is now inscribed on a plaque hanging inside that pedestal. Below her sonnet, a small caption presents the story behind it. Many years ago author John T. Cunningham wrote, “The Statue of Liberty was not conceived and sculpted as a symbol of immigration, but it quickly became so as immigrant ships passed under the statue.” However, it was Lazarus’s poem that permanently stamped on Miss Liberty the role of unofficial greeter of incoming immigrants. She has since become a symbol for liberty throughout the world. and her name Mother of Exiles. "Keep ancient lands, your storied pomp!"